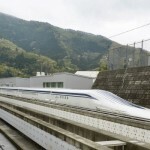 A Japanese maglev train has set a new world speed record-speeding down the rails near Mount Fuji at 375 miles per hour. The new record comes just days after the same train broke its own 12-year record by running at 366 mph. The maglev is short for a “magnetic levitation” train, which means it hovers above the physical tracks instead of gliding along them. The rail employees who were on board of the ride described it as “comfortable and stable.” Read more at the Guardian.